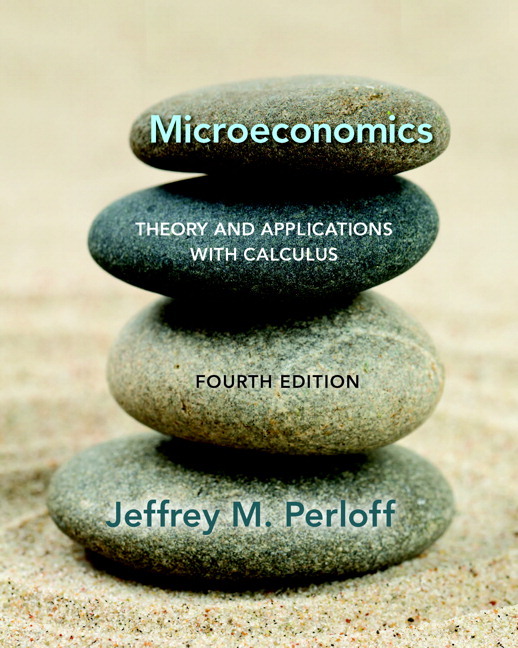 Significantly revised and updated with new real-world examples, exercises, and applications, this Fourth Edition of Microeconomics: Theory and Applications with Calculus remains the premiere microeconomics text to marry formal theory with robust, thoroughly analyzed real-world problems. 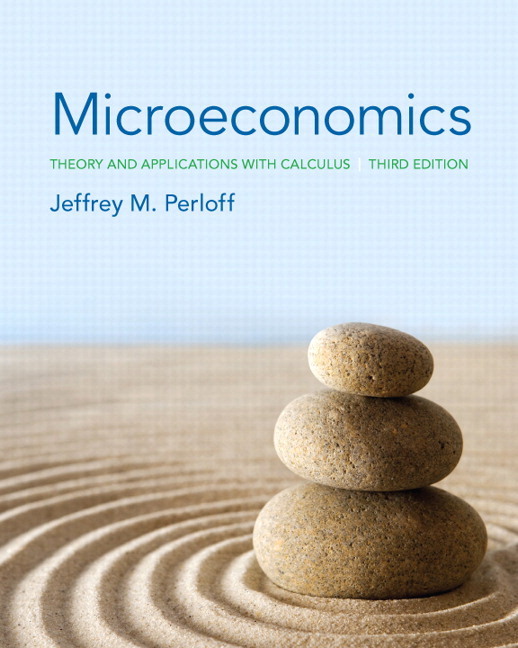 Intended as an intermediate microeconomics text, Perloff introduces economic theory through a combination of calculus, algebra, and graphs. The text integrates estimated, real-world problems and applications, using a step-by-step approach to demonstrate how microeconomic theory can be applied to solve practical problems and policy issues. Compared to other similar texts, the author also places greater emphasis on using contemporary theories–such as game theory and contract theory–to analyze markets. Students, if interested in purchasing this title with MyEconLab, ask your instructor for the correct package ISBN and Course ID. Instructors, contact your Pearson representative for more information. REVISED! 117 end-of section applications illustrate the versatility of microeconomic theory. 84% are new or have been revised for this edition and focus on diverse topics such as the derivation of an isoquant for semiconductors using actual data, the amount by which recipients value Christmas presents relative to the cost to gift givers, why oil companies that use fracking are more likely to shutdown, and whether buying flight insurance makes sense. REVISED! 744 end of chapter exercises, of which 27% are new or have been revised for this edition. NEW! and UPDATED! Real-World Examples, which use real people, real companies, and real data to illustrate basic microeconomic theory, provide students with a practical perspective that showcases the versatility of modern microeconomics. Examples include monopoly theory as it is applied to a patented pharmaceutical, Botox; oligopoly theories used to analyze the rivalry between Coke and Pepsi, and between United Airlines and American Airlines on the Chicago—Los Angeles route; Apple’s monopoly pricing of iPads; and multimarket price discrimination through the use of data on how Warner Brothers sets prices for Harry Potter and the Deathly Hallows Part 2 DVD across countries. REVISED! 111 Challenges and Solved Problems, of which 8% are new or have been revised for this edition. Solved Problems provide students with a step-­by­-step model for working out qualitative and quantitative problems using algebra and calculus. Students get the opportunity to practice the method modeled in a series of related exercises at the end of the chapter. Challenges combine an Application and a Solved Problem. Each chapter (besides Chapter 1) begins with a Challenge, which discusses a real­-world issue, and concludes with one or more questions based on that discussion. At the end of the chapter, a Challenge Solution answers these questions. Chapter 3 contains a new section on finding an interior solution using a short cut. The utility constant elasticity of substitution (CES) function is now the same as in the production chapter. Chapter 4 uses the estimated utility function from Chapter 3 to derive a demand curve. Chapter 5 underwent a substantial revision, particularly the sections on equivalent variation and compensating variation, as well as the effects of taxes on labor supply. Chapters 6 and 7 have new estimated examples. Chapter 7 has a revised section on opportunity cost, a new section on short methods to minimize cost or maximize output, and a new discussion of the relationship between economies of scale and returns to scale. Chapter 8, on the competitive firm, is substantially rewritten, particularly the sections on perfect competition, profit maximization (especially shutdown conditions), the free entry and exit condition, and long-run market supply when input prices vary with output. Chapter 9 on the competitive market has a new introduction, uses a new estimated oil market model, and has an updated discussion of agricultural programs. Some of the major revisions include the sections on regulation, monopsony, and networks. It also includes new material on the dominant firm-competitive fringe model. Chapter 13’s section on dynamic games is rewritten, and the section on auctions contains new material. Chapter 14’s section on cartels has been revised and updated. The first half of Chapter 18, on asymmetric information, has been reorganized and rewritten. Extensive coverage of problems from resource economics, labor economics, international trade, public finance, and industrial organization analyzed using contemporary theories is included. Game theory is employed to analyze both static games (including prisoners’ dilemma, chicken, and other games) and multi-period games (such as collusion and preventing entry), and special attention is paid to auction strategies. Chapters 14, 16 through 19 employ game theory to analyze oligopoly behavior, investing given an uncertain future, pollution (the Coase Theorem), and other topics. What-If Policy Analysis sections use microeconomic models to probe the likely outcomes of changes in public policies. Students learn how to conduct what-if analyses of policies such as taxes, subsidies, barriers to entry, price floors and ceilings, quotas and tariffs, zoning, pollution controls, and licensing laws. The text analyzes the effects of taxes on virtually every type of market, as well as the limitations of applying economic theory to policy analysis. Practice. Algorithmically generated homework and study plan exercises with instant feedback ensure varied and productive practice, helping students improve their understanding and prepare for quizzes and tests. Draw-graph exercises encourage students to practice the language of economics. Learning Resources. Personalized learning aids such as Help Me Solve This problem walkthroughs, Teach Me explanations of the underlying concept, and figure Animations provide on-demand help when students need it most. NEW! Videos. Key figures, tables, and concepts from the textbook are presented in step-by-step animations with audio explanations of the action. These new videos are embedded in the eText accessible through MyEconLab. Select End-of-chapter Questions and Problems—consisting of algorithmic, draw-graph, and numerical—are available to students for additional practice or as assignments. Test Item File questions are available for assignment. NEW! Solved Problems from the textbook are available in MyEconLab and focus on important economic issues such as analyzing government policies and determining firms’ optimal strategies. They give students a model of how to solve an economic problem by breaking it down step-by-step. Each Solved Problem in MyEconLab and the eText also includes at least one additional graded practice exercise for students. These interactive tutorials help students apply basic problem-solving skills to homework, quizzes, and exams. The goal is for students to build skills they can use to analyze real-world economic issues they hear and read about in the news. Additional Readings (Additional Applications, Supplemental Material, and Solved Problems) are available in MyEconLab. Appendices and Answers to Selected End-of-Chapter Exercises are also available on the Companion website at www.pearsonhighered.com/perloff. Study Plan. Shows students sections to study next, gives easy access to practice problems, and provides an automatically generated quiz to prove mastery of the course material. Digital Interactives. Focused on a single core topic and organized in progressive levels, each interactive immerses students in an assignable and auto-graded activity. Digital Interactives are also engaging lecture tools for traditional, online, and hybrid courses, many incorporating real-time data, data displays, and analysis tools for rich classroom discussions. Pose a variety of open-ended questions that help your students develop critical thinking skills. Monitor responses to find out where students are struggling. Use real-time data to adjust your instructional strategy and try other ways of engaging your students during class. Manage student interactions by automatically grouping students for discussion, teamwork, and peer-to-peer learning. Real-Time Data Analysis Exercises. Using current macro data to help students understand the impact of changes in economic variables, Real-Time Data Analysis Exercises communicate directly with the Federal Reserve Bank of St. Louis’s FRED® site and update as new data are available. Current News Exercises. Every week, current microeconomic and macroeconomic news stories, with accompanying exercises, are posted to MyEconLab. Assignable and auto-graded, these multi-part exercises ask students to recognize and apply economic concepts to real-world events. The powerful Gradebook records each student’s performance and time spent on the Tests and Study Plan, and generates reports by student or chapter. Enhanced eText. The Pearson eText gives students access to their textbook anytime, anywhere. In addition to notetaking, highlighting, and bookmarking, the Pearson eText offers interactive and sharing features. Students actively read and learn, through embedded and auto-graded practice, real-time data-graphs, animations, author videos, and more. Instructors can share comments or highlights, and students can add their own, for a tight community of learners in any class. Reporting Dashboard. View, analyze, and report learning outcomes clearly and easily. Available via the Gradebook and fully mobile-ready, the Reporting Dashboard presents student performance data at the class, section, and program levels in an accessible, visual manner. LMS Integration. Link from any LMS platform to access assignments, rosters, and resources, and synchronize MyLab grades with your LMS gradebook. For students, new direct, single sign-on provides access to all the personalized learning MyLab resources that make studying more efficient and effective. Mobile Ready. Students and instructors can access multimedia resources and complete assessments right at their fingertips, on any mobile device. Experiments. Flexible, easy-to-assign, auto-graded, and available in Single and Multiplayer versions, Experiments in MyEconLab make learning fun and engaging. UPDATED! Real-World Examples, which use real people, real companies, and real data to illustrate basic microeconomic theory, provide students with a practical perspective that showcases the versatility of modern microeconomics. Examples include monopoly theory as it is applied to a patented pharmaceutical, Botox; oligopoly theories used to analyze the rivalry between Coke and Pepsi, and between United Airlines and American Airlines on the Chicago—Los Angeles route; Apple’s monopoly pricing of iPads; and multimarket price discrimination through the use of data on how Warner Brothers sets prices for Harry Potter and the Deathly Hallows Part 2 DVD across countries. Videos. Key figures, tables, and concepts from the textbook are presented in step-by-step animations with audio explanations of the action. These new videos are embedded in the eText accessible through MyEconLab. Solved Problems from the textbook are available in MyEconLab and focus on important economic issues such as analyzing government policies and determining firms’ optimal strategies. They give students a model of how to solve an economic problem by breaking it down step-by-step. Each Solved Problem in MyEconLab and the eText also includes at least one additional graded practice exercise for students. These interactive tutorials help students apply basic problem-solving skills to homework, quizzes, and exams. The goal is for students to build skills they can use to analyze real-world economic issues they hear and read about in the news.